Four people have been arrested after an attempted robbery at a jeweller's which was foiled by members of the public. 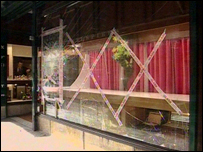 A shop window was smashed by a sledgehammer during the attempted raid on Thursday at Michael Spiers in Lower Lemon Street, Truro, in Cornwall. Onlookers tried to wrestle four people to the ground during the robbery. Two people were arrested at the scene, and two were taken into custody later. Three men and a woman are currently in custody at Newquay police station. Devon and Cornwall Police said a community support officer was one of the first officers at the scene and made an arrest after the robbery attempt on Thursday afternoon. Two others escaped from the scene by car but were spotted in the Idless area of the city. Following a short foot chase by police, two more men were arrested.